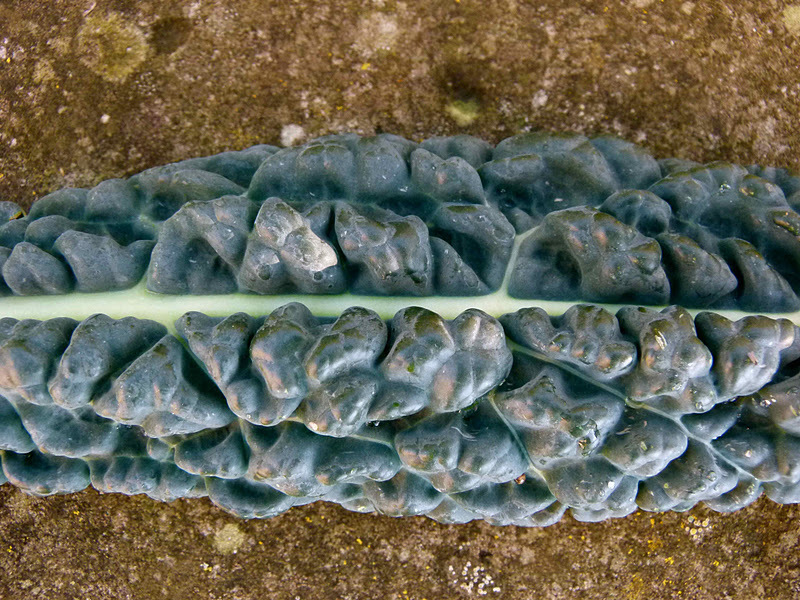 Kale has an image problem. 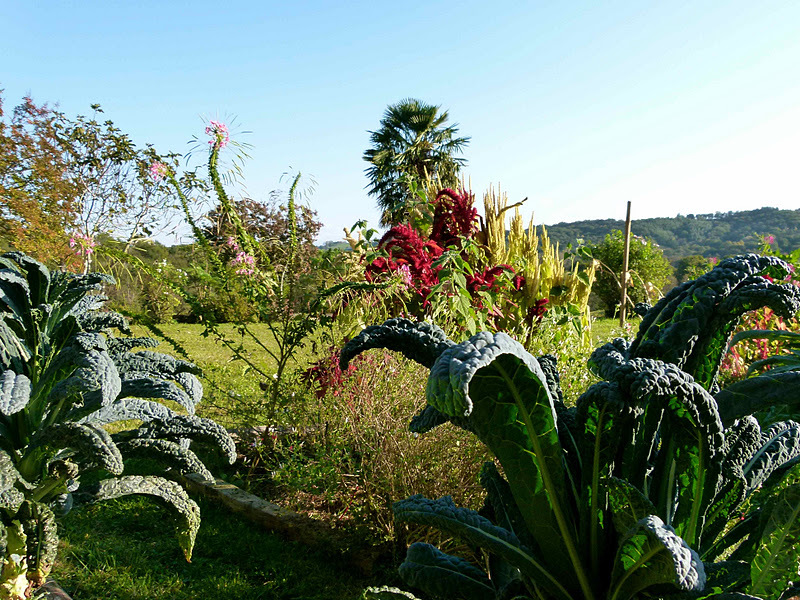 Most people think of caterpillars, starvation soups and school-kitchen smells of rotting leaves but it is in fact the oldest and most venerable cabbage, closest cousin to the wild cabbagy plants that grow on the adriatic and mediterranean. 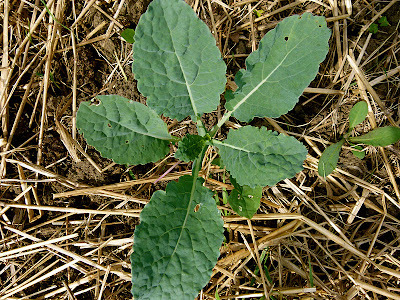 The wild one was domesticated sometime in the BC era and has given rise to plants as varied as the kohlrabi, broccoli, cauliflower, brussels sprouts and of the course the kale. Kale was the most popular green vegetable on the continents until cabbage arrived on the scene and today, in the Bearn, because of its association with rations and war wounds has been forgotten and left to decorate the roundabouts between Salies and Sauveterre de Bearn or the borders of municipal gardens. A sad history for this heartless yet generous cabbage leaf, teeming with vitamins and minerals, bloated with antioxidants and deliciousness. Kale has helped us Europeans survive the coldest of winters since the earliest of times, as they are not only resistant to frost, but like the parsnip, their taste improves with a sharp burst of cold as the starch is reduced to sugar. 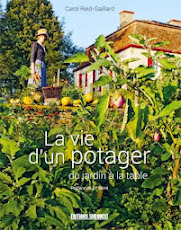 I remember after a hard winter in our family garden, it was the only vegetable still standing when everything else was rotting and black. It is the true survivor of all vegetables. 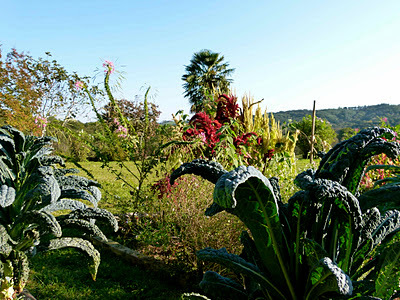 Over the years, I've tried growing them all; the frizzy leafed westlandse, the purple napini, the lacinato rainbow and even a red ursa but the only kale that I can love with a frenzy is the Cavola Nero or black palm kale with its rippling pillows of dark green and dusky blue leaves growing almost as high as myself. The plumes of heavily fringed leaves are so lovely, I believe I would grow them even if their taste was not so singular. The young leaves are soft and tender like spring greens while the older are tougher but stronger flavoured and need cooking to remove their slight bitterness. While a savoy cabbage is harvested as a whole head, kale leaves can be picked individually on an "as-you-need-it" basis and its commendable to pick them as such, as a harvested leaf loses its distinctive flavour with time. 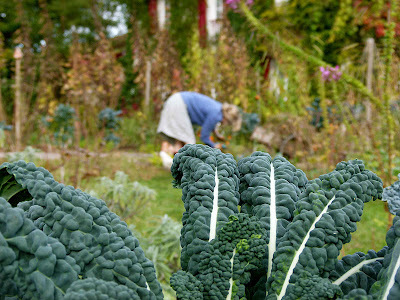 Kale is most intrepid member of the cabbage family with a well-deserved reputation for being able to grow almost anywhere. I plant them between the rose bushes or beds of cosmos, spread out among the garden beds as I would a ornamental plant. 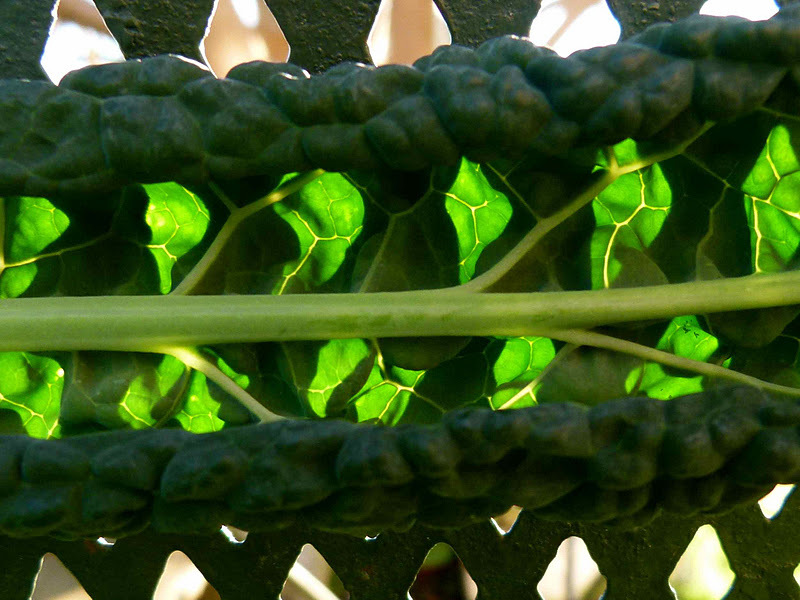 Cook the kale in a large pan of salted, boiling water for 5 minutes. Drain well and chop finely. Keep warm. Put the 3tbsp of butter in a frying pag over a moderate heat and add the bacon. Cook until golden. Add the spring onions and cook for a further 2 minutes. Stir in the kale to absorb the flavours and remove the pan from the heat. Peel the potatoes and chop into evenly-sized pieces. Put the potatoes in a large saucepan and cover with cold water and a add a pinch of salt. Bring to the boil and cook for 20 minutes or until soft. Drain well and return to the saucepan. Add the rest of the butter and mash well then beat with a wooden sppon until smooth. Off to Ireland tomorrow and will return the photo...! I would not have missed this posting for anything. 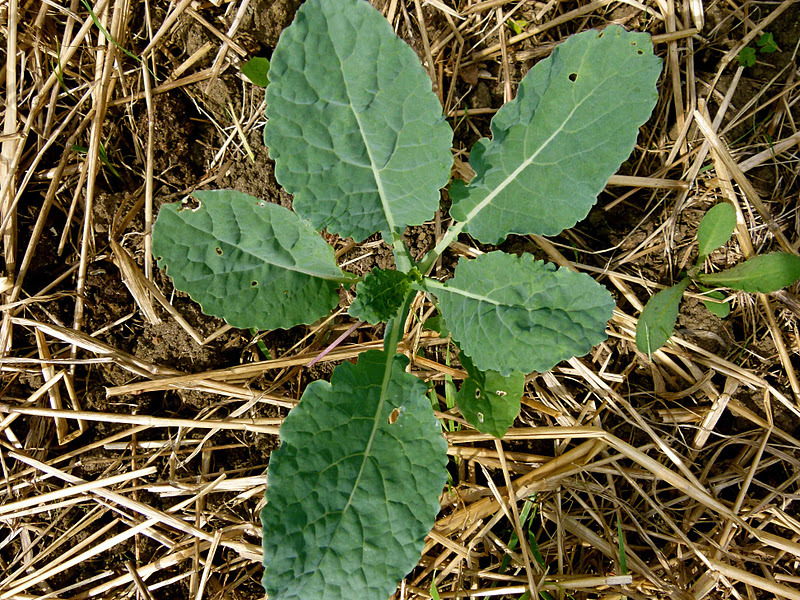 In Virginia (USA) and further south kale is much appreciated and this information will enrich our understanding of its adaptations. 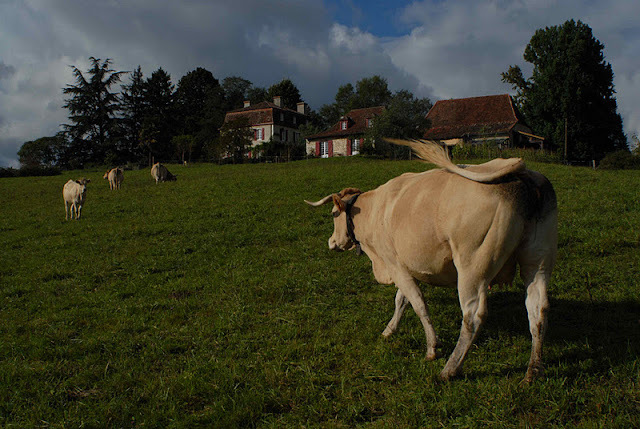 I know, it loves to float as ribbons in a japonesque miso - and as you say, fortifies this way in winter, visually as well as texturally on the palate. Now you're talking Southern language... in Savannah, Georgia we eat kale (or collard greens) and beans on New Year's Day for good luck, a dish called Hoppin John. PS-If you're ever looking for a fine book about Southern food, I can recommend a wonderfully titled tome: The Happy Table of Eugene Walter, An Ardent Survey of Southern Beverages and A Grand Selection of Southern Dishes Employing Spiritous Flavorings. It's so charming and full of interesting recipes, rather like this blog! and of course here in northern california, kale is practically revered for it's nutritious value, it's ability to withstand every weather, and the love bay area people have for this food. there are "kale chips" sold in the shops, slow baked kale leaves, dried like a dried fruit. 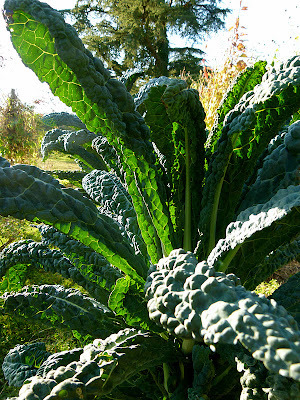 dinosaur kale is what they call your variety, and i have fed my son so many kale dishes that he can hardly face it these days ! ooops! alice waters says simply sauté in garlic and olive oil, then add bread crumbs and parmesan cheese- voila. i love that you have included this humble veg along with parsnips, another winter food close to my heart. Thank you Lily - I'm going to find this book somewhere! 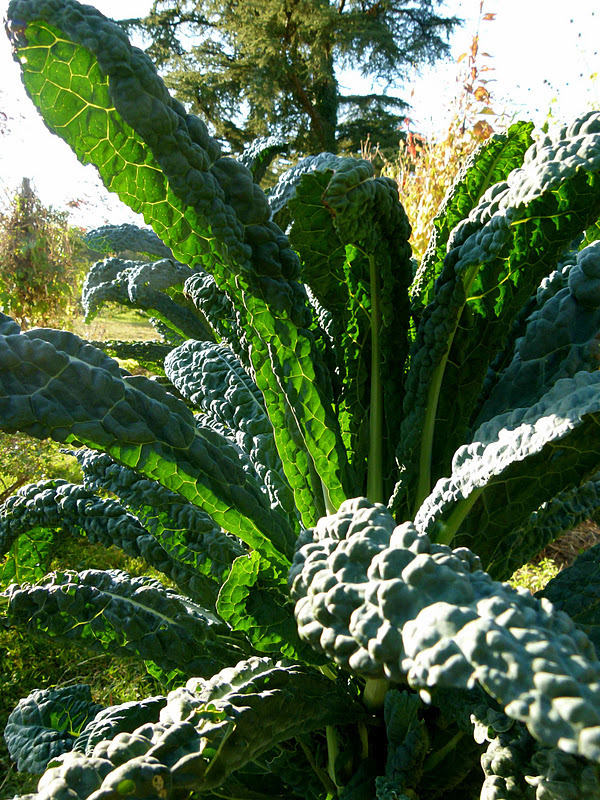 Dinosaur Kale - even a better name!